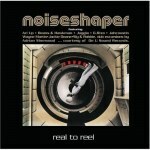 On its third album, Real To Reel, Noiseshaper mixes and remixes material, both new and old. While Axel Hirn and Flo Fleischmann are skilled mix-masters, it's hard to tell where several of the tracks stop and start. This makes several clusters of tracks seem longer than their average duration of four minutes. Pieces such as "Love To the Rhythm" sound as if they were nicked from one of Saturday Night Live's "Deep House Dish" skits and ooh-wee, T-Shane, it gets repetitious. Sonic similarities on several pieces aside, to its credit, on Real To Real Noiseshaper does an excellent job of blending several different genres on its mixes, most noticeably on "Me Done", featuring Ari Up on vocals. The reggae-rock based track is punctuated by acoustic blues and thumping beats, and delivers an industrial edge to reggae that sounds almost dangerous. Noiseshaper sprinkles in some bhangra and jazz throughout the disc to break up the monotony, and creates several enjoyable moments. Nevertheless, fans of ambient music will enjoy this disc as it fits perfectly as a trance-inducing background that packs a few punches to slug dub-fiends out of their pleasant reverie.